The last of the bedsocks for the grandchildren. This pair is for Miss Ten who has a long skinny foot. 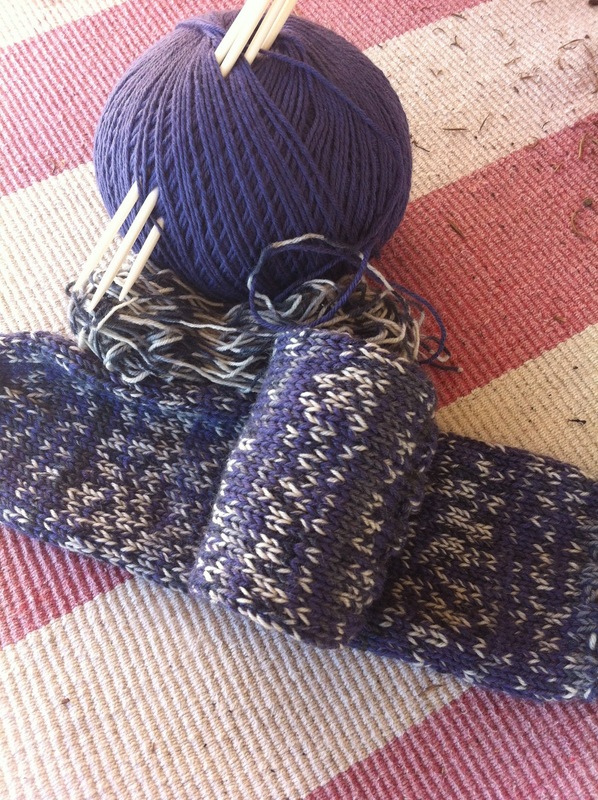 They are made from some Bendigo 5ply and some grey/white Patonyle, both from my stash. 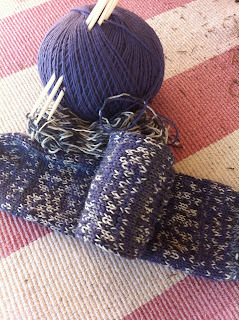 I had another two pairs to do for the other family and was getting very bored with bed socks. They were down here a few days ago so I took Miss Twelve aside and showed her several pairs of new, unworn socks which I had put aside. She tried on a pair which were a good fit so she chose them. They are not as thick as the other pairs I have done, but she will be fine. Her foot is not quite as long as mine, but is much wider. She takes an E fitting in shoes, possibly EE. So that was a quick pair and she was happy. Her younger brother, Master Seven, the youngest grandchild did not want bedsocks at all. He told me he could easily wear "any old socks" to bed. What he really wanted was some fingerless gloves. He's seen the gloves I made last year for his cousins. Only one problem. They absolutely have to be RED. Screamingly bright red. I have little red in stash and certainly none of what I do have is suitable for gloves for an active little boy. Fortunately I saw elsewhere this morning that Morris and Sons have their mid-year sale on. I will pay them a visit and should be able to find something suitable. When I said I could make gloves, he grabbed a bit of paper and drew round his hand for a pattern. I think he felt he had to strike while the iron is hot. He even wrote his name and the date on the paper. Have you noticed the emphasis on warming food around knitting blogs recently? I think it's because of two things. There have been lots of recipes posted for cakes, biscuits and slices. Possibly because many of us participated in the World's Biggest Morning Tea in one way or another. I think the other reason is that the cold weather has suddenly kicked in after a long , over-warm autumn. Too warm for the season really, and we have been coasting along with easy, light meals. Now it's cold and winter warmers are called for. I received half a small, very fresh cauliflower in my fruit and vegetable delivery. I really like cauliflower and use it in many ways. Yesterday I made cauliflower with cheese sauce. It was very good, smooth sauce and lots of cheese. I had some for dinner. A real winter warmer of a dish for a winter vegetable on a chilly day. When I was shopping yesterday early in the morning, I found two BBQ chooks in the large local IGA. They were date stamped from late the night before and each had been reduced to $5. I bought both and had some in a sandwich for lunch yesterday. Today I donned some gloves and pulled the flesh off both of them. I kept some aside for tonight and packed the rest in individual ziploc bags. I now have eight meals sized amounts in bags in the freezer and two lots of bones for soup stock. Pretty good value for $10 in total. 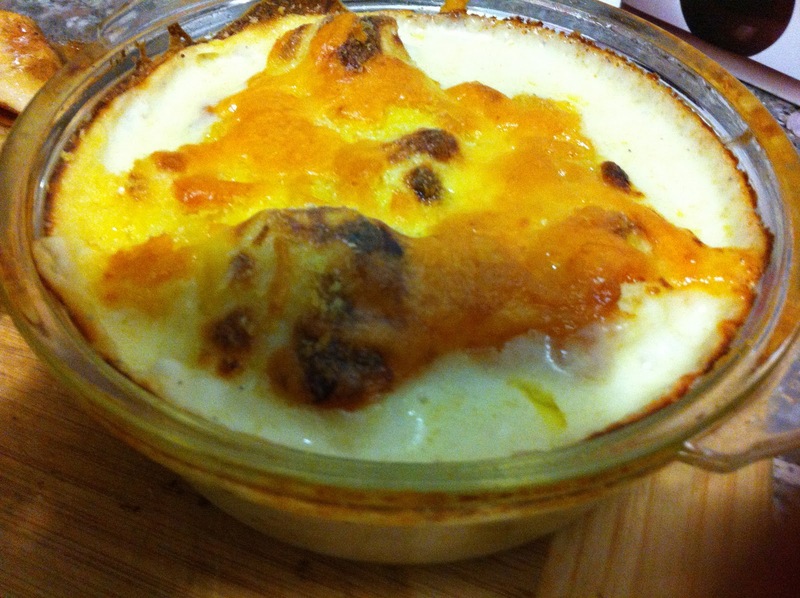 I have cooked some leeks and stirred them into some of the leftover cauliflower cheese. Added in the chicken. Tonight I will put some pastry over the top and have a pie. Some other vegetables and dinner's done and dusted. I do not often eat sweet things and even less often do I have dessert. Last night I quartered a Beurre Bosc pear and cut core out. 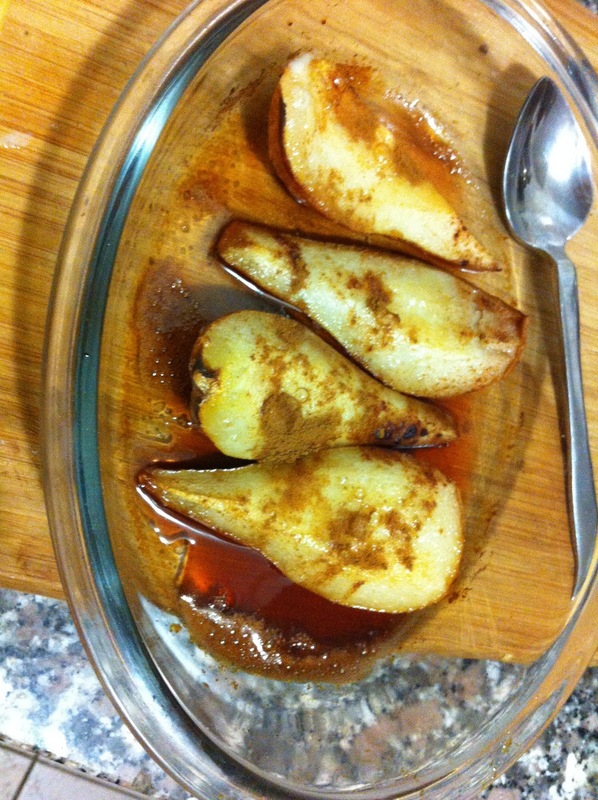 I put it in small, old pyrex dish with a tiny sprinkle of brown sugar and about two tablespoons of tawny port. Fifteen minutes in the oven which was on for the cauliflower and I had a pleasant sweet course. The port and sugar caramelised into almost toffee in the dish. Today had a heavy fog which took ages to clear. It left an unpleasant looking day. It's grey and looks bleak. It actually is supposed to be 19° but I really don't think it's near that here. Chicken and leek pie should be just the thing. I love cauliflower. Your blog post makes me wish I was having supper at your house! Oh yes, cauliflower and a good cheese sauce, it makes my mouth water to even think about it. I love a good cheese sauce on lots of things. Cheese is my guilty pleasure, though I don;t think I am feeling guilty about it at all. I have been watching Little Paris Kitchen and I saw potato muffiny things with cheese in them: yum!! Lovely bedsocks, you've done a good job and those look really pretty. I laughed at the story of your grandson with his hand drawing. You've trained him well!! It was cold in southern WA but it was fairly warm in Perth and 25* at 5pm in Fremantle on our return from Rottnest. Somehow I was not prepared for the very cold weather (by comparison) here in western Sydney -- it was still so mild when we left on 25th May! I believe this morning was 1*C! So, yes, I a thinking about casseroles and soups where I had been doing grills and barbecues!